Remembering the pioneering digital past. Recognizing the best of digital today. Setting the stage for the future of digital tomorrow. One can trace the history of the World Wide Web just from the campaigns forged by Hollywood’s digital marketers. From the very first campaigns on AOL, to the first websites on the World Wide Web, to MySpace, Facebook, Snapchat – Hollywood, as an industry, has always led the way by using digital to innovate and engage fans with a tremendous number of first-to-market campaigns. In the beginning, Hollywood was the Wild West of digital. However, many of the campaigns from the 90’s and early 2000’s have been deleted- having never been officially archived or celebrated- as the works were not recognized for the historical value they now have. Hollywood In Pixels, Inc. is a 501(c)3 founded in 2015 to ensure that the seminal digital film campaigns that help drive digital marketing into the lexicon of Hollywood are recovered and preserved, as well as to ensure that the incredible campaigns of today and tomorrow are not lost to time. We love connecting with the trailblazers who created those groundbreaking digital film campaigns in the past, and meeting the innovators of today whose work is history in the making. Email us with your stories and leads to finding lost content at talkwithHIP@hollywoodinpixels.org. Bettina Sherick is an entertainment digital marketing veteran. A former 20th Century Fox International executive, she has led cross-functional virtual teams globally to produce ground-breaking campaigns for all types of films, from tentpole to indy. Sherick was named an Internationalist of the Year by the Internationalist Magazine in 2010, honoring marketing professionals who "break the mold" with their multinational brand communications, and is the recipient of the 2011 iMedia Visionary Entertainment Marketer Award. She has presented to audiences around the world about entertainment digital marketing, and authored a chapter on digital history in the book "Digital State: How the Internet is Changing Everything". We are on a pixel mission from God! Tigers love pixels. They hate cinnamon. A third-generation film industry veteran, Evan’s career began at The Walt Disney Studios where he sold film to theaters, managed Disney's relationship with McDonald's adult targeted promotions and on special projects including The Toy Story Fun House. He’s also worked for AOL, IGN, Fox Interactive Media and Napster. While at Rotten Tomatoes, he co-created the Certified Fresh program. Evan’s work on digital film marketing focus is now on social media platforms through his work at Brand Networks. Leave the gun, take the pixels. Dea Lawrence is the CMO of Variety responsible for driving Variety’s global branding and communications strategy. She oversees their custom content initiative, creative, public relations, ad sales program development, and the marketing and production of their 45+ annual events and summits. Throughout the 5 years she served as VP Sales for PointRoll/Gannett she provided strategic direction and guided her region’s focus to be customer driven. As VP of Digital Sales and Marketing for Variety she was instrumental in the creation, development, and growth of the business, as well as building and implementing the sales strategy for all online advertising sales. In addition to working with Silicon Valley start-ups, she was the VP Sales for TubeMogul’s enterprise software solution and the head of western sales for AT&T Adworks’ first-party data offering across mobile and desktop. Dea contributes regularly to advertising industry publications and speaks on panels. Gordon is the CEO of Stradella Road, a creative marketing agency that Fast Company Magazine named to its annual list of the World’s Top 10 Most Innovative Companies in Hollywood. For a decade at Time Warner, he led studio, digital, and cross-division integrated marketing, bringing more than 200 feature films to market--including The Lord of the Rings trilogy. Gordon has been honored to support the digital and social strategy of visionaries such as Professor Stephen Hawking and Academy Award-winning filmmaker Peter Jackson, and to have led digital strategy for Disney’s Lucasfilm acquisition, along with initiating strategic planning for ongoing Star Wars franchise development. There’s no crying in pixels! Jay Tucker is a marketer, educator and technology leader with more than 20 years of experience in the technology, academic and entertainment sectors. At UCLA’s Center for Management of Enterprise in Media, Entertainment and Sports (MEMES), Jay is responsible for the center’s vision, thought leadership, educational offerings and major events. In his role, he has built courses, partnerships and conferences focused on technology and innovation within the entertainment sector. As a seasoned technology leader, Jay is passionate about helping executives and entrepreneurs embrace disruption, drive innovation, and build powerful solutions. He has taught courses on technology management, digital media and media literacy to professionals at corporations and nonprofit organizations. He also serves as an advisor to early stage ventures and non-profit organizations. I love the smell of pixels in the morning. Todd Havens is a senior digital marketing executive of over 10 years who has produced first-to-market and award-winning campaigns for global media and entertainment Fortune 500 clients – movie studios, television and cable networks, toys and gaming. His love for pixels is eclipsed only by his love for his family. 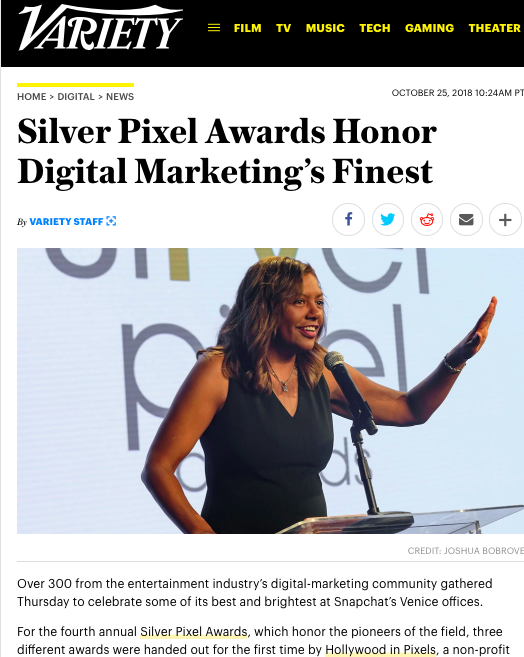 Every year, the Silver Pixel Awards honor the best and the brightest of digital Hollywood and groundbreaking campaigns from the past that set a new path in the evolution of digital marketing. ANY GIVEN SUNDAY - 1999: Don Buckley, Michael Tritter, Andrew Stachler - Warner Bros. Rising Pixel Honoree: Sarah Pollok, Vice President of Digital Media at Warner Bros.